Best Feature Documentary went to Axel Grigor’s entertaining portrait of Australian film editing legend Jill Bilcock: Dancing the Invisible. 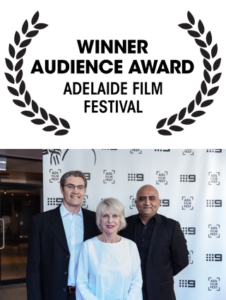 The Audience Awards, presented by the festival’s new venue partner GU Film House, were voted by the audience following each screening in the festival. Best Documentary winner Jill Bilcock: Dancing the Invisible, is a hugely entertaining documentary about the editor behind Baz Luhrmann’s red curtain trilogy of Strictly Ballroom (1992), Romeo + Juliet (1996) and Moulin Rouge! (2001), Australian classics Muriel’s Wedding (1994), Dogs in Space (1986) and The Dressmaker (2015) among many others. Bilcock’s cheeky charm and illuminating appearances by key collaborators make this a must-see for film lovers.